Dr. Scholl's is a footwear and orthopedic foot care brand owned by Bayer in the North and Latin American markets, and by Aurelius AG in its remaining markets worldwide. The brand in the North and Latin American markets was owned by Merck & Co. through its predecessor Schering-Plough until they sold it to Bayer on 1 October 2014. Aurelius AG bought the brand for all other markets from Reckitt Benckiser on 21 July 2014. 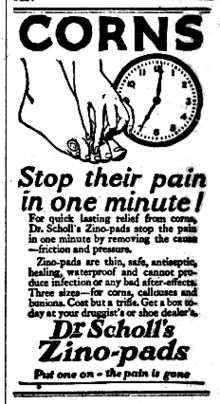 1923 newspaper ad for Dr Scholl's Zino-pads for corns. Podiatrist William Mathias Scholl started the brand in 1906, in Chicago, United States. The original company expanded globally to design and patent over 1000 foot care products and became a member of the Fortune 500 in 1971. After William Scholl died in 1968, Schering-Plough bought the brand. Under parent Merck & Co., Schering-Plough imports the product line from China and has a North American distribution agreement with the Brown Shoe Company. In 1984, Schering-Plough sold the global brand and non-North American operations to European Home Products, who manufacture and distribute footwear and foot care products under the Scholl brand. This page was last edited on 10 April 2019, at 19:27 (UTC).